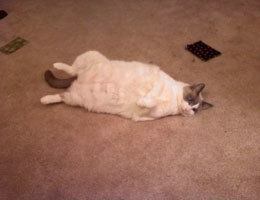 Obesity is a common problem in dogs and cats. It is estimated that 40% to 50% of dogs are overweight and 25% are obese. Obesity is typically caused by excessive food intake and insufficient exercise. It is a problem more common in older, less active pets. It is also more likely in dogs that are fed homemade meals, table scraps and snacks . There are many obesity-related health problems, and some medical problems (like hypothyroidism) can lead to obesity. Therefore, it is very important to have your pet examined by a veterinarian annually. Some problems associated with obesity are heart disease, reduced life span, joint pain, labored breathing, fatigue, diabetes, pancreatic disease, and ruptured ligaments in the knee. Keeping your pet at a healthy weight will not only lead to a more active life, but a longer and healthier one as well. Your veterinarian will use weight, size, body condition score and other factors to determine if your pet is obese. Don’t feel bad if you are told your pet is too heavy. 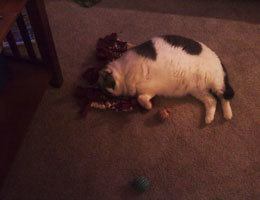 Loosing weight is challenging, but helping your pet live longer and feel better is worth the effort. Talk to your veterinarian before changing your pet’s eating and exercise habits. We can help you formulate a safe plan for your pet’s unique circumstances. In general, weight loss should be accomplished slowly. The most effective weight loss plans include increasing activity and feeding fewer calories. The goal is for your pet to lose 2% of its body weight per week. For example, a 100 pound dog should lose no more than 2 pounds per week. There are many effective dietary strategies for weight loss. You can divide your pet’s daily ration of food into several, smaller portions fed throughout the day. This helps boost metabolism as the food is digested. Also, if your veterinarian deems it appropriate, you can decrease the total amount of food fed per day, or gradually change to a lower calorie diet. Also, eliminating or decreasing treats is very effective for weight loss. It is amazing how many calories are in commercial dog treats. You can also substitute healthier, low calorie options for treats. Some examples are apple slices, carrots, green beans and banana slices. Using food puzzles or slow feeders will help your pet eat less. It takes time for the brain to recognize that the stomach is full. So if we encourage the pet to eat slower, they will feel full and stop eating before they gorge themselves. Increasing your pet’s exercise does not need to be time-consuming. Small bursts of activity several times a day are most effective. Once your veterinarian determines that your pet is fit for exercise, you can begin by gradually increasing activity. Start by taking your dog on short walks regularly, and increasing to 10 or 20 minute walks or jogs once or twice a day. You can also use interactive play to encourage movement. This strategy works well with cats as well as dogs. Some ideas include a laser light pointer, playing fetch or keep away, or using interactive toys (such as a feather on a stick for cats). Whatever the starting point with your pet, you can be successful in helping him or her to lose weight. Small changes over time can make a big difference! Do not get discouraged, but continue to be diligent in your efforts. Your pet with thank you for it with increased energy and a healthier life.